Der er gratis adgang, og det foregår på Central Saint Martins College of Art and Design, Platform Theatre, Handyside Street, London N1C 4AA – tæt på King’s Cross. 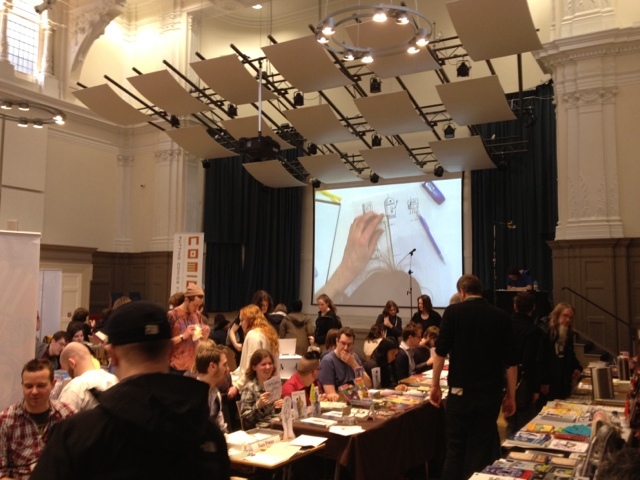 This weekend’s Comiket Independent Comics Fair was only my second attendance, the first being a few years ago in a dingy, windowless room at the ICA; the big, bright, beautiful Bishopsgate Institute was a great improvement. Sadly, it seems even this venue wasn’t large enough. A few exhibitors had been relegated to a distant basement (I think they should be reimbursed; hardly anyone noticed that room), and as it was, too many tables had been crammed into the main hall, resulting in much too narrow aisles. For most of the day they were a real obstacle course. The projected live drawing throughout the day was a good idea but next time could we please skip the music? In a crowded hall you don’t really need to increase the noise level; obviously the death metal late in the afternoon was downright obnoxious but even the soothing bass of Leonard Cohen in the morning just added to the cacophony. Despite grumbles, a big thank you to the organisers is in order for getting all these creative people together in one room (okay, two). The London comics scene has a great sense of punk DYI energy, and in recent years this has been coupled with increased ambitions and skills, spearheaded especially by a small handful of publishers. I came away feeling energised. I hardly had time to look at anyone else’s stuff, let alone stop to talk to other exhibitors but I got home with good stuff from Gemma Correll, Joe Decie, eleven-year-old Zoom Rockman, Nick Edwards and Francesca Cassavetti. And Nelson. Oh, and thanks as well to people who said nice things about my books or even bought some of them. (If you did, odds are it was Post-It Monsters. Wow, that was popular.) I hope to be back! Er du i London på lørdag? Så kom endelig forbi Bishipsgate Institute, hvor der 11-18 er tegneseriefestival med et hav af forlag og tegnere. For bare fem år siden var Storbritannien et tegneserieuland, hvor der skete meget lidt, og det var svært at få øje på flotte tryksager og gode tegnere (ud over Tom Gauld, Simone Lia, Raymond Briggs og Posy Simmonds. Og måske en eller to til), men pludselig er der sket en eksplosion med forlagene Nobrow og Blank Slate som øh udløsere? Nej, metaforen falder sammen. Men der sker spændende ting. Nå ja, og Aben maler har en stand. Der på lørdag. Hvad skal I om små to måneder? Ja, jeg ved da ikke, hvorfor I lige skulle være i London d.21. 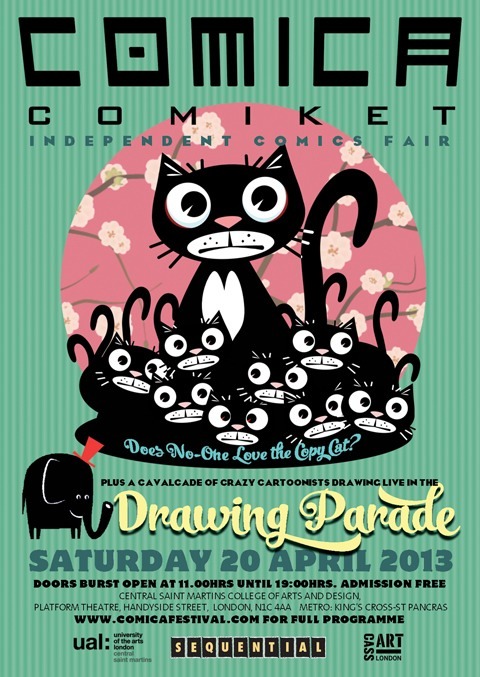 april, men hvis nu, så kom endelig til Comiket, independent comics fair. Storbritannien var lidt af et tegneserieuland for bare fem år siden, men en lille håndfuld forlag er dukket op og har støvet virkelig dygtige tegnere op, så det er en svir. Aben maler har også en stand, var det jeg ville sige.